This store is the place to go for all your car parts! Stop in today to see why they are the second largest car part store in America. With replacement parts, interior and exterior accessories, truck & towing tools & equipment, fluids & chemicals, performance product, and repair help, they have something for everyone. 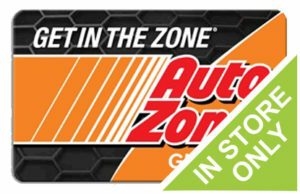 Purchase an Auto Zone gift card from Cards2Cash, and save money on your entire purchase. Founded in 1979, they now have over 5,000 stores nationwide, as well as locations in Mexico and Brazil. Regardless of where you live, there surely must be a store nearby. And with an Auto Zone gift card purchased from Cards2Cash, you can save money on all your purchases. Cards2Cash also offers discounted cards for other stores you know and frequent. At Cards2Cash, we work to bring you a large assortment of gift cards. We’ve got cards from auto stores to restaurants, so be sure to check out our other great listings such as Advance Auto, Napa Auto Parts, Pep Boys and more! With Cards2Cash on your side, saving is easier than it ever has been before! Do you have an Auto Zone gift card that you aren’t going to use? Cards2Cash will turn your unwanted gift card into money in your pocket! We pay top dollar for gift cards for restaurants, department stores, hardware stores and more. Just visit one of our retail locations for cash on the spot or fill out our easy online form and we’ll get back with you immediately with an offer for your unwanted gift card. Whether you buy your gift cards from Cards2Cash or sell them to us- we’re your one-stop gift card shop!